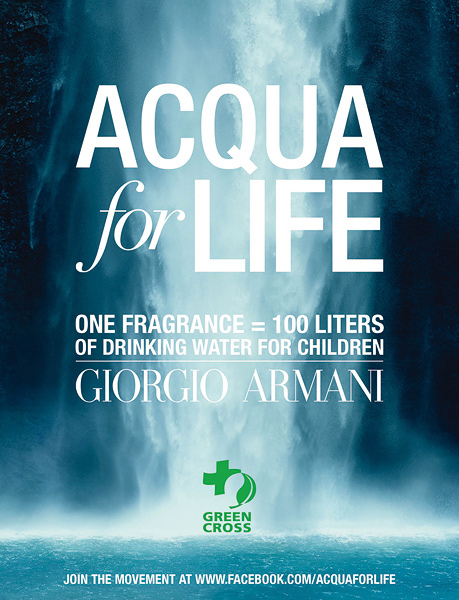 Let me introduce you to the “Acqua for Life Challenge”. A facebook campaign set up by Giorgio Armani Beauty (in conjunction with their popular fragrances Acqua di Giò and Acqua di Gioia). The campaign aims to provide a minimum of 40 million litres of drinking water to populations without any access to it, working in partnership with Green Cross International to raise everyone’s awareness of this issue. 900 million individuals are still deprived of safe, clean and healthy water for their daily essential needs. Water that is essential for drinking, eating, guaranteeing a minimum of hygiene and maintaining one’s health. The goal of this challenge: To offer this year a minimum of 40 million litres of drinking water to populations in need. Because they are the most vulnerable to water-borne diseases and it is their future that is taken hostage by this uncertain water supply, children will be the primary beneficiaries of the donations collected by the “Acqua For Life” campaign. The operation will initially begin in Ghana, supporting the Smart Water for Green Schools project: In this west African country some 40% of the rural population does not have access to drinking water. The money raised will then be used, over time, to finance similar operations in other countries. So, how can you contribute? I’ve set up a Lipglossiping Acqua For Life Facebook group and all YOU need to do to contribute 10 litres of water to the cause is join up. It will literally take you 15 seconds. SEARCH for the term Lipglossiping in the left hand side community search bar and hit on JOIN. Thassit! All signed up, 10L of fresh, safe drinking water with your name on it! The Crabtree & Evelyn Hand Care Amnesty. Get your free hand-cream here! Models Own new Spring/Summer Nail Collection!